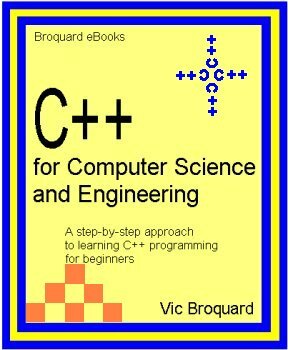 Undoubtedly, the best beginning book around for the novice, C++ Programming for Computer Science and Engineering is designed for CS1 and other courses covering beginning programming in C++. It is aimed at readers with little or no programming experience. C++ Programming for Computer Science and Engineering is a very readable beginning textbook and is quite inexpensive. See how readable it is by reading a sample chapter. See for yourself what you can learn to do! Note: to write programs like those in the samples, you will need to learn much beyond this, the beginning point in learning C++ programming. Check my Blog article on which path is right for you. C++ Programming for Computer Science and Engineering is designed for a college level introductory C++ course for both the Computer Science and Engineering curricula. Written for the novice programmer, this book assumes no prior knowledge of computer programming. The main elements of the language are introduced step by step in a logical, gradient manner.Each chapter has three main sections. The Basics Section presents the new features of the language. This is followed by two applications sections, one geared for Computer Science majors and one for Engineering majors. Thus, the student can see solid examples of the language’s application in their field. Good programming design practices are introduced early and utilized in every sample program in the book. These include Top-down Design, the Cycle of Data Processing (Input, Process, Output) and a form of elementary pseudocoding with a main storage diagram. By continuous examples, the student is shown that the optimum way to write a program is to design before you begin the actual coding into the C++ language. C++ Programming for Computer Science and Engineering contains 47 complete programs which are available ready for compilation and your experimentation. The sample programs along with a Microsoft Visual C++ .NET project for each is included with the book. The samples are of increasing sophistication and illustrate many of the basic algorithms needed by the beginning programmer. There are samples for the Basic, Computer Science and Engineering Sections. All sample programs are extensively commented so that they could be easily maintained. Generally, the Computer Science examples concentrate on the types of programs often found in this discipline as well as business data processing. They include such items as using input and output files, control break reports, summary reports, merging files of data, file update programs with emphasis on writing reusable, generic functions, sorting arrays, binary search, character string manipulation, use of structures and binary file actions. In contrast, the Engineering sample programs illustrate problems found in many different areas of engineering and numerical analysis. The basic principles of numerical analysis are presented in Chapter 5 with each chapter after that covering another analysis tool. The sample programs thus illustrate many different types of equation calculations. Covered are root solving (using the bisection method, Regula Falsi, Newton’s Method and the secant method), numerical integration using the trapezoid method and Simpson’s Rule, menu processing, plotting graphs, statistical computations, Least Squares Curve Fitting, matrix math operations, Gauss and Gauss-Jordan methods for solving equations and the use of structures to simplify parameter passing. Note that many of the engineering samples can also be profitably covered in a Computer Science course and vice versa. Vitally important to the learning process are the practice exercises at the end of each chapter of C++ Programming for Computer Science and Engineering. They are grouped into two categories: program design and syntax error correction. The design practice exercises assist the student to solidify the student’s understanding of how to utilize the new language elements presented in that chapter, such as looping. The rule I stress is “If you can say what you want to do step by step in English, you can program it; if you cannot say it, you cannot program it.” The design exercises solidify their ability to write programs. The next section is called “Stop! Do These Exercises Before Programming.” These sections illustrate the common ways that a programmer can goof up the syntax of the new language elements. The student is asked to fix the errors so that the code will work. These represent the common syntax errors made by students and programmers alike. If these practice problems are worked before the student begins to program, drastically fewer errors are made. Students commonly state that these “Stop!” exercises are harder than the actual programming assignments. This is because they must understand fully the new language elements and their syntax in order to find the errors. Note that each of these can be entered into the computer and the problems found and fixed. The last section of each chapter consists of programming assignments. They are clearly labeled CS-nn or Engr-nn. There is a wide variety of assignments available. Some are more difficult than others. It is highly recommended that a student do at least one programming assignment from each chapter, if not more. C++ Programming for Computer Science and Engineering has a lengthy appendix on how to use the older Microsoft Visual C++ 6.0 Integrated Development Platform to create, debug and run programs. Finally, from an education viewpoint, all new terms and symbols are defined at their first point of usage with action definitions and illustrations. The greatly aids the student by preventing the inadvertent misunderstood or not understood word. From the students’ point of view, C++ Programming for Computer Science and Engineering is very readable. C++ Programming for Computer Science and Engineering can be used both in Computer Science courses and in Engineering programs as a first or beginning course in programming. For example, it was used at Illinois Central College in the Cmpsc 125 Introduction to C++ and is currently used in Engr 230 Engineering Applications in C++ courses.The Fourth Edition of C++ Programming for Computer Science and Engineering has been updated to use Microsoft’s Visual Studio .NET 2005 compiler and the 2008 compiler. Both sets of sample programs are included. C++ Programming for Computer Science and Engineering comes in Adobe pdf files. One file contains the entire book. There are also individual chapter pdf files. All of the sample programs are provided as well as the test data needed for some of the programming assignments are provided. If you do not have the Adobe Reader, Get Adobe Reader by clicking this link. The book package comes in a self-extracting exe file.